It’s vital to celebrate business success! It builds team spirit, motivates individuals and it gets everyone pulling together. But it can be difficult to engage everyone in the celebrations. A wine tasting event is a superb way to show your team, or your customers, how much you appreciate them. It’s an ideal way to build team spirit during or at the end of a busy team meeting or conference, and excellent for ‘breaking the ice’ before a team or client meal. We offer interactive tastings too with quizzes and wine-related activities. The emphasis is on fun and celebration! We can organise a full-service tasting experience tailored to meet the demands of business clients at your offices or local conference venue. A wide range of high-quality wines, specially selected to highlight different tasting experiences is chosen to meet your specific requirements. 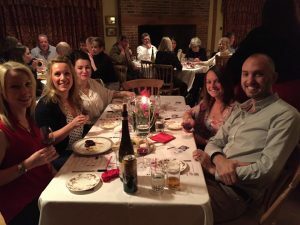 We also host fund-raising wine tastings for local and national charitable organisations.